Krule had the most liked content! So....Backland at 6 years with a 5.35 AAV. Now that's over with and he's not going anywhere for a while...what's next? Personally, I would like to see Brodie go before Backland. 3 yrs at 3.5 - 4 mil should be about right. Trade Brodie to the Eastern conference for what I would hope to be a RHS RW/C. Then find a replacement for Kulac. The more I see him play, the more I question his hockey sense. He has become so indecisive, especially lately. Maybe someone from Stockton could come up to take his place. I am wondering if we really need to do anything at this time. However, if anyone gets moved, I would hope it's for draft picks only. A six game winning streak in this league is nothing to sneeze at and we're entering our mandatory rest period in pretty good shape. The nicks and bruises will now get a chance to heal. We're getting very solid goaltending and the defense is finally joining in the rush. The overall team confidence is high. I see no reason this can't continue. I'm not convinced he would score 20 goals here. I definitely wouldn't be trading Anderson for him. Personally, I hope we stand pat with what the team looks like now and see where the chips fall once training camp is underway. Here's what I got from his post game interview. He wasn't blaming anyone. I heard a lot of truth in his answers. He even stated that he needs to stop more breakaways. But the reality is that It's up to the team in front of him to limit those opportunities. They aren't! As a former goaltender, I can appreciate his take on their woes. Lately, I've been seeing so many horrible giveaways (we must lead the league in that category!) by this team, resulting in great opportunities for the opposition. I so love seeing JH on the blueline during a powerplay try to pass cross-ice through 2 opposing players. I also agree with Gulutzen's post game assessment of the team. They're fragile and lack push back under adversity. You see it in their faces every time they get behind. It's like "Oh no, here we go again!" Trying to catch up in the last 5 minutes of the game is not playing a complete game. The whole team is making blatant mental mistakes resulting in breakaways and 2 on 1's. I have also seen the defense out of position a lot more than they used to be. Is it the coaches system? I'm not sure. Is it because they're trying to hard or they are still growing as a team? I would prefer the latter and hope that things are corrected ASAP. Until the players man up or grow up, this will continue. It's easy to say the correct thing. It's harder to implement when you lack the confidence and belief to execute it. I will, however, still support my team...no matter what! Wouldn't he have to agree with the removal of his NMC? Provided expansion will occur. I agree with this. You drafted a center...you need him to play at center. He played his rookie year for the most part on the wing, played sheltered minutes to a degree and waited for him to develop a bit more physically and mentally. Another summer filling out his frame and he should easily make the transition back to his normal position given the skill level. 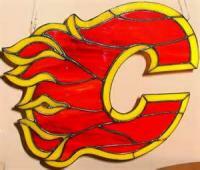 Getting him some wingers to play with should be the way the Flames go. Can't wait to see what he can do next year. While Murray remains my first choice, I feel that his price tag just went a lot higher now that the Pens are on to the Eastern Conference Finals riding his coattails. We will find out later tonight if Dallas advances to the Western finals and the second round pick becomes a first round pick for us. Just spit balling, but could that 1st rounder + a 2nd be enough to get Murray out of PIT? Is that over payment to acquire him? Barring that happening, I think if we take the go big or go home attitude and are serious about getting that starter we need, Anderson from Anaheim is still the way to go. But that's just my opinion. This would make the most sense to me as well. The first pick from Dallas would be a pretty good bargaining chip for that search. If it becomes a second round pick, we could always add to make the offer more attractive. I think we can take Matt Murray off any plans we may have been dreaming about going forward. He is playing great under the pressure of playoffs! Pittsburg would be crazy to let him go. I think so as well. He may be speedy and have a decent shot, but IMO it's the hockey IQ that is ultimately hurting him. IIRC that was the knock against him when he was drafted. How about Colbourne or Ferland (not my choice but he is more or less a hometown boy), a prospect and one of our 2 round picks? Would that be a good starting point or final offer for Hutchinson or Hellebuyck (I'd prefer him)?